Still reeling from this week’s Season 3 finale? How about a healthy dose of TURN-related history? 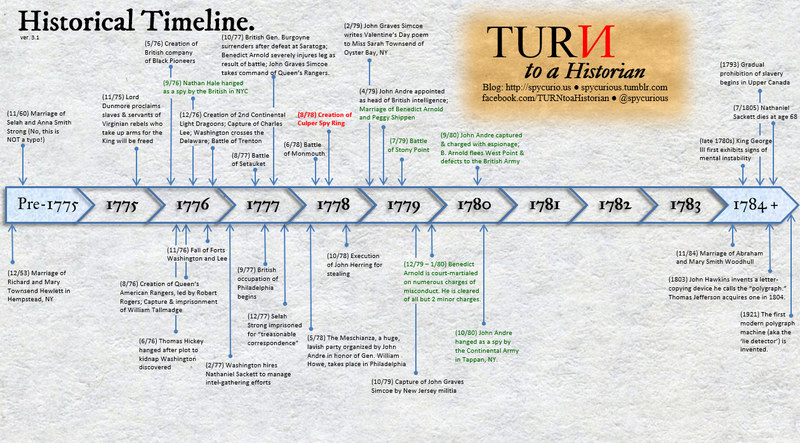 We’ve updated the Historical Timeline with events mentioned and/or depicted in TURN Season 3. In a slight change from previous timeline updates, all the Season 3 events are labeled with dark green text, to more easily distinguish this seasons’ additions from the events mentioned in Seasons 1 and 2. While the timeline itself is embedded below, don’t forget to visit the full Historical Timeline page for a chronological listing of events, including external links to relevant history websites. Enjoy! 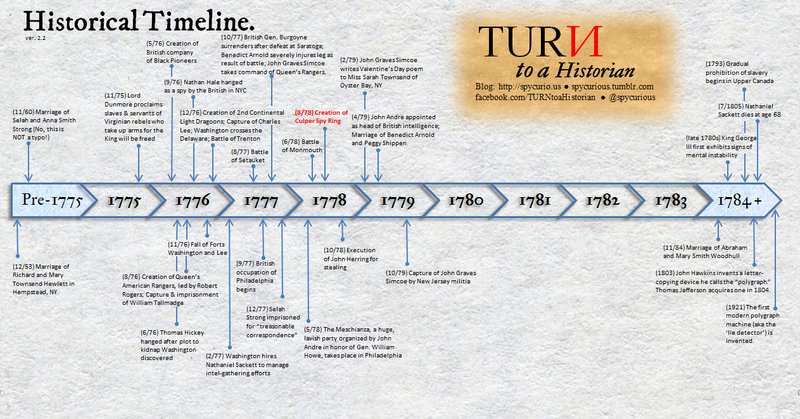 TURN Historical Timeline, version 3.1. Events mentioned in Season 3 are listed in green. Click to enlarge. There’s no doubt that Season 3 of TURN began slowly, and with very few connections to actual historical events (see our previous post lamenting this fact). Evidently the writers were saving all of the spy action and historical precedent for the last few episodes, which drew heavily upon the well-documented Andre-Arnold affair of late 1780. Most of the new timeline events deal with Benedict Arnold, since a large part of Season 3 revolved around the dramatic buildup of his infamous defection — and John Andre, who ends up paying the steepest price for Arnold’s actions. You’ll see Arnold’s court-martial, defection, and marriage to Peggy Shippen all plotted on the updated timeline. Another event that was prominently (if very briefly) mentioned in the Season 3 finale was the execution of Nathan Hale — an event that was first mentioned in TURN Season 1 and has been on the Timeline ever since. For some bizarre reason, the show announces Hale’s execution date as October 22, 1776, instead of September 22 — a bizarre and seemingly unnecessary factual error that provides no benefit for the show’s storyline development. It’s no surprise that a Hollywood history show deviates from a 100% perfect chronological unfolding of historical events, of course — that’s why we made the Timeline in the first place! Some deviations, however, are much easier to explain than others. Think there’s a historical event missing from the Timeline? Is there some ingenious reasoning I’ve missed behind TURN moving a semi-obscure historical date around by a mere 30 days? Leave a comment below (or tweet me, or email via the Ask page) and let me know! This entry was posted in Site updates, TURN news, Uncategorized and tagged amc turn, battle of stony point, benedict arnold, john andre, Nathan Hale, peggy shippen, timeline, turn amc, TURN: Washington's Spies. Greetings, TURNcoats! 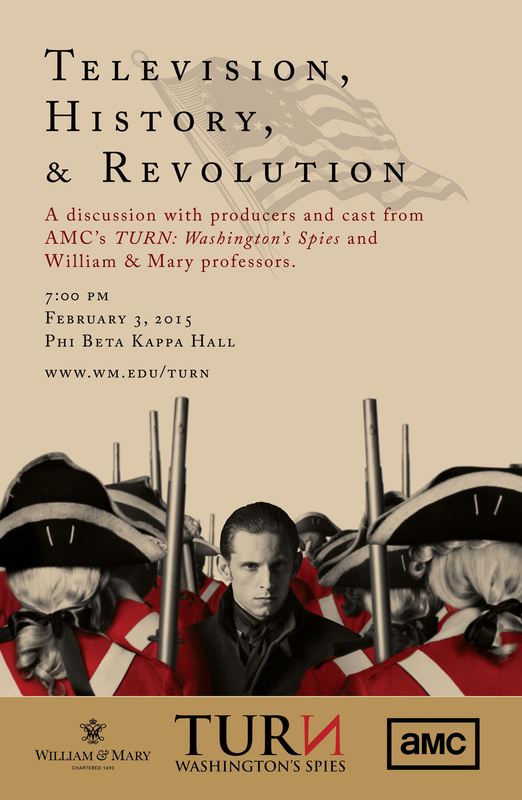 The premiere of Season 3 of “TURN: Washington’s Spies” is upon us — only a few hours away at the time of this posting. First, we’d like to welcome back blog readers both new and old! If you’re new to TURN, or just finishing re-watching Seasons 1 & 2 in anticipation of tonight’s premiere, you probably have a whole bunch of historical questions. We understand. 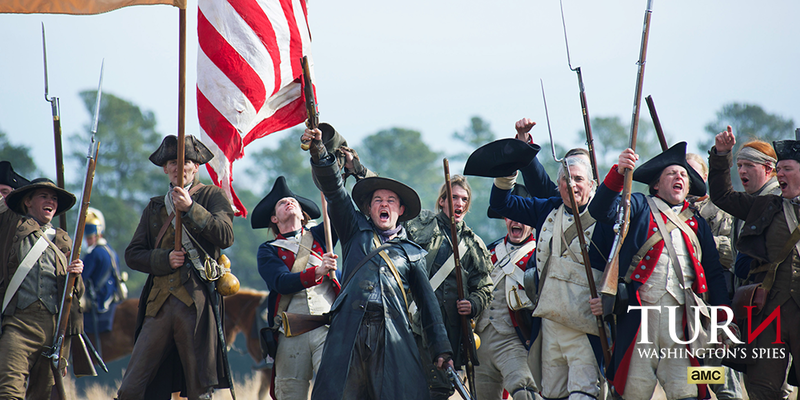 In general, TURN takes a whole lot of liberties with the historical record — to the point where reading real history books won’t help you predict where the show is going to go! Of course, this blog is here to help with your historical accuracy questions. And now we’re making it a little easier to find the answers you’re looking for with our new Topic Index page, which now happily occupies its own little tab in the header menu at the top of our website. Yes, you can always search the archives of the blog like you have before — by date of posting, by using the search bar, or via tag cloud (all located in the sidebar on the right side of every page). Still, we thought it would make things a little easier to have a general subject listing, especially for those who are new to the blog. Our most popular posts are sorted both by topic (e.g. Revolutionary War spycraft, slavery, material culture) and by character. Let us know what you think — and happy reading! One of TURN’s promotional banners for Season 3. Overall, AMC’s promotions for TURN Season 3 have leaned heavily on references to the themes and candidates running in the current presidential election. This entry was posted in Site updates, TURN news, Uncategorized and tagged season 3 premiere, Site updates, turn season 3, TURN: Washington's Spies, turnamc, washington's spies, washington1778.